By: Sharon D. Anderson, Ph. 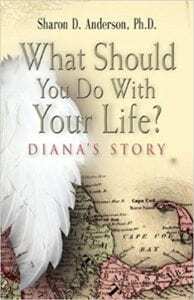 D.
Sharon D. Anderson, the author of What Should You Do with Your Life?, is an Angel Communicator with a Doctorate from the American Institute of Holistic Theology and certificates of study from Astara levels one to four. Her book relates the story of Diana, a woman struggling through life until she finds herself following the guidance of her guardian angels. Given Anderson’s background, the use of angels in this story is not metaphoric but rather instructional, as the author seems sincerely eager to teach her readers about the benefits of staying in tune with one’s guardian angels. Anderson mainly relays the story of Diana’s evolution through conversations rather than narration. Much of the plot is developed in a chatty, run-on fashion, a style that feels as if readers are eavesdropping on the characters’ internal dialogues. The tone is nearly child-like as the characters prattle on to themselves with an overly generous use of exclamation points, capital letters and giggles. This book would have benefited from additional editing for consistency, redundancies, and rambling dialogue, which take away from the impact of the author’s compassionate intent to share her vast knowledge with readers. Thus readers may come away from this book prompted to work with their guardian angels in order to enact positive techniques toward self-actualization and manifestations of their dreams. At the very least, What Should You Do with Your Life? offers earnest and heartfelt reminders to stay positive, listen for messages from the Universe, stay in the moment, express gratitude…as well as the decidedly British belief in the infallible medicinal purpose of a good cup of tea. Quill says: One woman learns to accept the guidance of her guardian angels in order to realize her dreams.